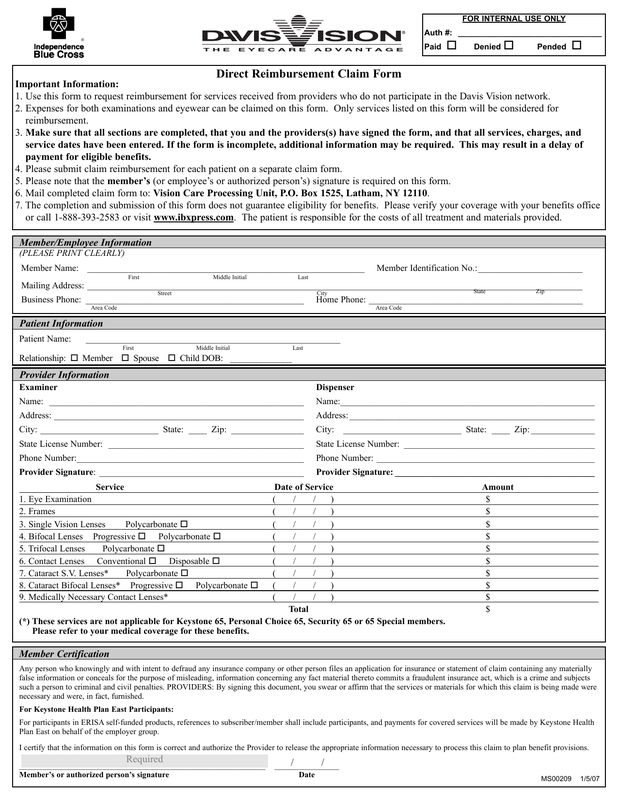 Download the Davis Vision Reimbursement Claim Form. PLEASE NOTE: If you are a member of the Davis Vision Group, you do not require a claim form of any kind. All that is needed is to provide your name. The rest is on file, it’s that easy. However, if you are not a member and have paid out of pocket for services or if you have used Davis Vision Services as an out-of-network provider and you are entitled to reimbursement, complete the form provided. Step 1 – Read all information at the top of this reimbursement form. Each claim will require a separate claim form. This information is to be completed by the vision service provider during your visit. They are to complete all of the information in section 3 and provide signature. Please Note: These Services are not applicable for Keystone 65, Personal Choice 65, Security 65 or 65 Special Members. You will need to refer to your medical coverage for these benefits.